Terry tells Shane that her ex Charles is hassling her. She asks Shane to stay over to protect her. Eileen tells Des and Max that she's turned George's proposal down. Des and Max are very surprised. MAX: He was such a good bloke! EILEEN: *YOU* marry him then! 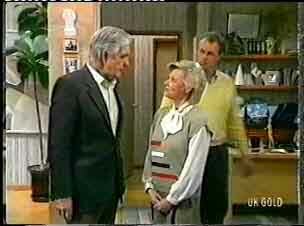 Max decides to make himself scarce leaving Des to talk to Eileen. Des asks why she turned George down - they got on so well with each other. She accuses Des of wanting to get rid of her. DES: Why did you knock him back? Max is sees Danny's French teacher and sits with her at a table. She invites him out to see a band tonight. He isn't sure, but she talks him round! Jim is fed up of Scott's guitar strumming. Jim says that maybe Scott will get a new guitar for his birthday. Scott feels tempted to leave school too, like Danny, then he'd have some money! Douglas pops round with some flowers for Helen. He's booked the registry office and also made an offer on the cottage in the country. Lucy isn't very pleased to hear this, but Helen is chuffed to bits. When Helen and Douglas have gone, Lucy asks Jim if he'll be glad when Helen leaves. He hugs her. Des is helping Daphne to put away the shopping. 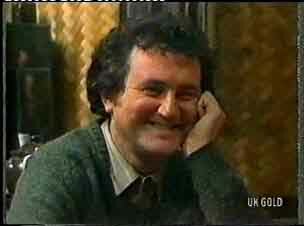 Harry comes in and is very disappointed to hear that Eileen turned George down. HARRY: She...? Well, blow me down. I thought we were on a dead cert, there! DAPHNE: You two set this up didn't you?! She is appalled. Harry says he has to get rid of Eileen from the shop somehow and begs Daphne to take over. Daphne says she's looking for a nice 9 to 5 job, not shift work. 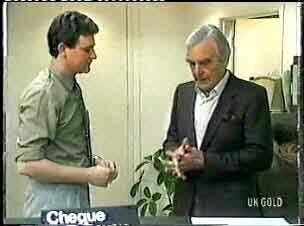 Des tells Douglas that he can't give him a loan. Des tells George how sorry he is about Eileen's refusal. He thinks Eileen is crazy for knocking him back and she won't even tell him why. Eileen is having a chat with Daphne who is being very non-judgemental. But she does tell Eileen that she has to give people a chance. Eileen apologises to Helen for jumping to the wrong conclusion about her holiday with Douglas. Helen graciously accepts her apology. Jim is talking over some plans with a business colleague. Apparently it is quite a high-risk venture. Eileen has asked George to meet her. They sit at a table. Harry brings them some tea, interrupting. Douglas comes looking for Helen - he looks rather on edge. He tells her that he has some bad news. 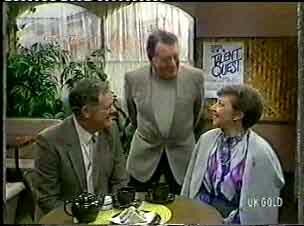 Harry keeps interrupting Eileen and George, but finally they have a chance to chat. Eileen says his friendship means more than anything to her, but marriage simply wouldn't work. He walks off sadly. EILEEN: Harry, I'm sorry to have to do this to you, but I'm going to have to give you my notice. Harry tries not to look too delighted(!) and accepts. Douglas explains that someone else has made a cash offer on the cottage so they're sunk - he can't sell his house in time. Helen is a bit disappointed, but says it isn't the end of the world. Harry tells Daphne that he's making her manageress of the Coffee Shop. 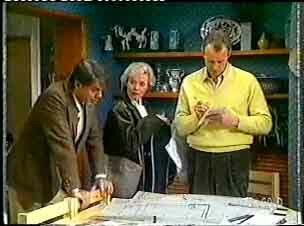 Daphne doesn't believe that Eileen put in her notice, but Harry swears that it's true. Apparently she needed a "change of scene". He starts laying guilt trips on Daphne and she finally agrees. DAPHNE:(resignedly) When do I start? HARRY: There's no rush. Finish your lunch first! 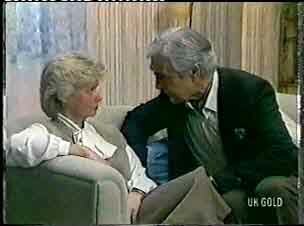 George tells Des that he'll miss Eileen. DES:(in disbelief) Are you alright, George?! He's decided to go off for a holiday to Hayman Island to recover. 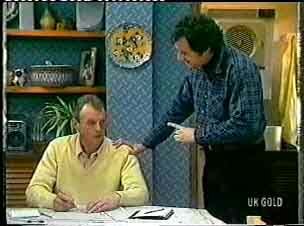 Jim is telling Max about the cash offer on the cottage. He's very disappointed on Helen's behalf. Jim says he'd do anything for Helen after all she's done for the family over the years. In the living room, Helen and Lucy are hanging out. Helen tells Scott she's got a present for him, but she's hidden it. Lucy starts a game of hot and cold until Scott finds the guitar. He's chuffed to bits. Des invites Eileen over for dinner, but she doesn't fancy his cooking(!) He invites her to stay with him for a while, but she's decided to move on. She cryptically says that George doesn't understand about marriage and she "couldn't go through all that again". DES: George wouldn't leave you. EILEEN: You don't understand, Desmond, all about marriage. DES: I was pretty close to it a couple of times. EILEEN: It...it's the adjustments you have to make. Well, I know it's different for men and I know it's easier for women nowadays but...I just...well, I, it's my fault, I can't change. It'd never work. DES: Don't be so hard on yourself, Mum. EILEEN: You're a good boy,Desmond. You are a good son. You know you're the one thing in my life I don't regret. Well, now. Will you say goodbye to Daphne for me? Des tells Eileen that Harry has roped Daphne in to work in the Coffee Shop. EILEEN: Well, she's certainly made me face a few home-truths. You know, you could do worse than marry her, Desmond. DES: Fair go, mum...there's enough wedding in the street, I don't want to steal next-door's thunder. EILEEN: Yes, it's a pity I won't be here for Helen's wedding. Eileen has decided to go on holiday - to Hayman Island!